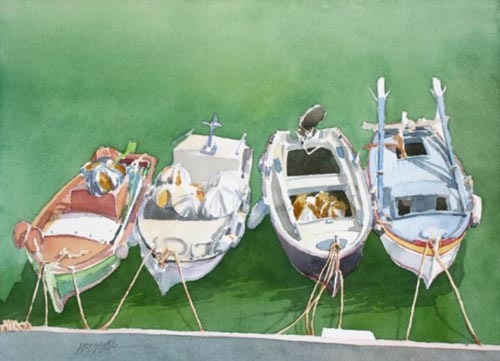 Join us on Tuesday, April 16, for Robert Dvorak’s “Watercolor” demo – mastering the travel experience, see, learn, and remember more when you draw or paint as you go. Robert Regis Dvorák has been showing people how to make drawing and painting fun and easy to learn for many years. He draws on a rich background of unique experience for his presentations – including: traveling in 69 countries including all of Western and Eastern Europe, Russia. New Zealand, Southeast Asia, China, Japan, Panama and Peru. Robert has sailed in the Greek islands, designed maternity centers in Trinidad, drawn caricatures in Japanese night clubs, traveled over 10,000 miles of India drawing the famous Hindu temples, hiked on the Great Wall of China, and climbed to the top of the Great Pyramid in Egypt. Robert has a Bachelor and a Masters Degree in Architecture and taught Architecture Design, drawing and watercolor at the University of Oregon and UC Berkeley. 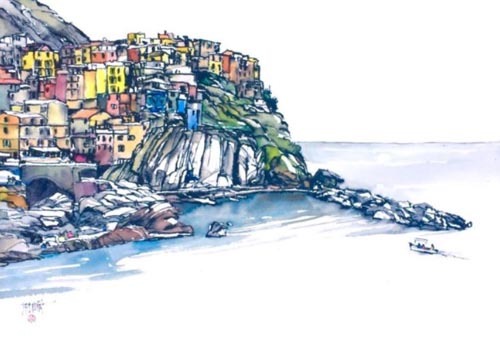 Robert has written and illustrated a number of books including, Travel Drawing and Painting, The Pocket Drawing Book, The Practice of Drawing as Meditation, Drawing Without Fear, Experiential Drawing, and Selling Art 101. Robert has had 22 one-man exhibitions of his work.